Virtuoso flamenco guitarist for hire. Jorge Bravo is a virtuoso flamenco guitarist whose unique style of performance demonstrates a wide range of influences from classical and flamenco to gypsy jazz and Latin American styles. Few acoustic guitarists in Europe can compose and play with such personality and technical skill as Jorge Bravo. Born in Santiago de Chile in 1973 and based in UK since 2005, he works actively as a concert guitarist, composer, producer and teacher. 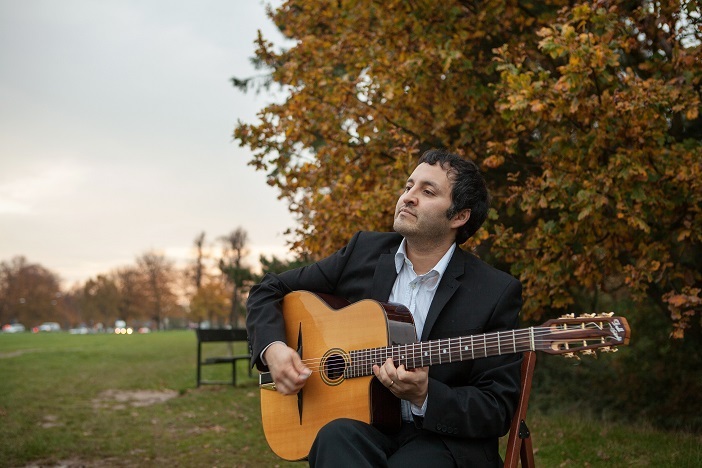 He has a unique style of virtuoso performance which demonstrates a wide range of influences from classical and flamenco to gypsy jazz and Latin American styles. Jorge has played in prestigious venues around the UK such as the Royal Albert Hall, Queen Elizabeth Hall and Womad festival; and in some of the most renowned theatres and festivals throughout Europe. In June 2006 his talents were internationally recognised when he won a first prize at the ‘Nino Ricardo International Guitar Competition’ held in Murcia, Spain. Jorge is currently promoting and performing music from his third independent album ‘Imposturas’ with his new band – which includes percussionist Demi Garcia, bassist Paolo Minervini, flamenco dancer Jesus Olmedo and jazz vocalist Emily Dankworth. Plus other gypsy jazz options.